Slots with progressive jackpots are some of the most popular games one can engage in at renowned online casinos and are in high demand on behalf of players due to the immense winning potential they carry. Such slots are usually all linked into jackpot networks so that all participating players contribute to the prize pools across different online casinos that use the services of the same software developer. The lives of many lucky winners have been transformed the moment they have landed the symbol combination that triggers the gargantuan progressive prize. To further boost the appeal of their progressive slot titles, software giants like Playtech, Microgaming and NetEnt have decided to adapt some of their most popular jackpot slots for mobile play, which enables enthusiastic players to enjoy the games regardless of time and location. The above-mentioned software suppliers have optimized their best-known progressives for a comprehensive range of portable devices that operate on the widespread iOS, Windows OS, and Android OS. Players looking to end their gaming session as millionaires are typically given two options they can pick from. The more time-efficient option is for them to load the available progressive jackpot game directly in their smartphone’s internet browser as many highly regarded casino operators have fully mobile-responsive websites, which automatically redirect players to their mobile versions. 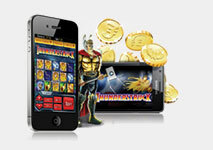 The second option for mobile players is to download and install their preferred casino’s native mobile application. Such mobile apps are usually readily available for a free-of-charge download. Owners of iOS smartphones and tablets can head to the App store and download the application of their casino of choice directly from there. Android users, on the other hand, usually have to download the casinos’ Android-based apps directly from the gambling operators’ websites as Google has adopted a policy of prohibiting real-money gambling content from their Play Store. 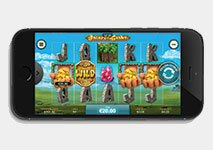 The progressive jackpot slots that are compatible with mobile devices function in the same manner as those, available for desktop computers. Such games are usually unavailable in practice mode and players are required to open real-money accounts, make a deposit, and contribute with their own funds. Progressive slots differ from their standard cousins in that their jackpots are not fixed, meaning that the progressive prizes keep escalating until they reach massive proportions. This is precisely what makes them so appealing in the eyes of slot fans. The progressive jackpots grow in small increments but the increase is exceptionally rapid due to the huge number of players contributing to the accumulation of the prize pools. Slots like Playtech’s Age of Gods and Microgaming’s Mega Moolah are connected to several other slot titles in progressive jackpot networks which are linked to all licensed mobile casinos that are powered by the two software leaders. The prize pools on such games reach sums in the seven-figure mark and hundreds of thousands of players fuel the jackpots. In order to keep players interested in the progressive slots after somebody has collected the prize, the jackpots usually start growing at a base amount (or a “seed”). A fraction of each bet goes towards the seed while a larger percentage of all wagers fuels the jackpot itself. One important thing to keep in mind is that if you are willing to give your favorite progressive slot a few spins on the go, you are recommended to play the maximum amount allowed per round. Otherwise, players do not qualify for the mammoth prize even if they manage to trigger the jackpot with the corresponding combination of symbols. With some wide-area progressive slots, it is the software developer running the jackpot network that provides the necessary seed amount after the prize is won. Below, slot fans will be able to find brief overviews of five of the best mobile slots, which offer life-changing progressive prizes that regularly hit the seven-figure mark. All five slots have been adapted for mobile play and can fit the smaller displays of portable devices like smartphones and tablets. Game controls have been optimized for mobile play as well, which is to say players will benefit from seamless interaction on their smartphones and can set the reels in motion with a single swipe of their fingers across the reels. Adjusting the size of your bets, the coin values and bet level is easy as pie on the go. Players will also be able to benefit from standard features, such as Auto Play, which is typically activated by holding the spin button for a longer time. Of course, mobile game controls will deviate slightly, depending on the software supplier that has developed a given mobile slot. The graphics of the five progressive slots listed below appeal to the eye with their bright and full colors, not to mention the higher resolution of the smartphones’ screens will render them even crispier. Make sure you have a reliable wireless or 3G/4G connection before you try your luck on any of these progressive slots – this will ensure a seamless gaming session without any lags. Mega Moolah must be the most popular progressive slot in the world and a favorite of millions of players on the global scale. The immense popularity of this 5-reel African-themed slot with 25 paylines can be attributed to its gigantic progressive prize which starts seeding at the staggering amount of $1 million or the equivalent in players’ currency of choice. This is great news because if you hit a jackpot of $8.1 million while using the GBP as your currency, for instance, the prize will not be converted to pounds according to the current exchange rates – you will still receive precisely £8.1 million. The original Mega Moolah takes players on a journey to the African savannah but there are several other titles from the series that contribute to the accumulation of the prize pools. These include Isis, Mega Moolah, and 5-Reel Drive variations. All these titles, alongside the original Mega Moolah, contribute to the accumulation of four different progressive prizes, namely the Mini, Minor, Major and Mega jackpots, with the latter being the biggest one. The jackpots are awarded at random with a wheel-of-fortune styled bonus game. In addition, the games offer some great extra features like wilds, scatters and free spins. 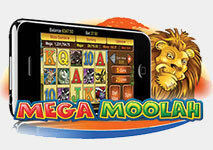 Mega Moolah has been adapted for mobile play, which is anything but surprising considering it is among the most popular titles on Microgaming’s catalog. The game is fully compatible with a wide range of devices that operate on iOS, Windows OS and Android OS. 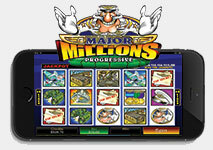 The progressive slot can be conveniently loaded in the browsers of players’ mobile devices. Slot fans have software giant Playtech to thank for the enticing progressive slot collection that is the Age of Gods. The games the suite comprises are all inspired and based on different gods, goddesses and characters from the mythology of Ancient Greece. The slots utilize five reels but the number of paylines varies between 20 and 25, depending on the title of choice. Similarly to the Mega Moolah suite, the slots from the Age of Gods series are all linked into a wide-area progressive network which allows the prize to escalate across all casinos running on Playtech’s platform. Another thing the games have in common is the four-tiered jackpot network, which is to say there are four different progressive prizes to be won. 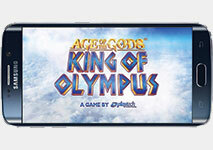 As much as 0.99% of each bet on any of the Age of Gods titles is divided equally and goes towards the four prize pools. The four progressive prizes are awarded at random and can be triggered even on losing spins. While players are not strictly required to bet the maximum amount, larger wagers are said to increase their chances of triggering the bonus game that awards the pots. Once the said game is unlocked, lucky players are guaranteed to walk away with one of the four progressive prizes. More importantly, you get the chance to collect the life-changing prize on the go since the Age of God suite is fully compatible with mobile devices running on Android OS, iOS, Windows Phone and Blackberry OS. Some of the most appealing progressive titles that are part of this suite include Goddess of Wisdom, Fate Sisters, Prince of Olympus, Furious 4, and King of Olympus, among several others. The graphics of each are spectacular while the immersive sound effects will further enhance the quality of players’ experience. Jackpot Giant is yet another favorite of Playtech fans but the colossal progressive prize it comes with is hardly the only reason for this. Playtech has spared to efforts in creating this 5-reel slot which provides players with the opportunity to bet on 50 fixed paylines. The slot is superior in terms of audio and visuals and features a friendly, pre-historic giant who beckons players to test their luck from the very moment they load the game in the browsers of their desktop or portable devices. Some interesting features you might be interested to know about include the wilds, scatters, and an enticing bonus game which is triggered by the bonus symbols landing simultaneously on the first and the fifth reels. The wild symbol is of additional interest because it not only helps you complete winning combinations but can potentially unlock the jackpot, provided that you have bet the maximum amount per spin. Winning the pot is tricky but far from impossible – all you have to do is land five wild symbols on payline number 1. The game is available across a wide range of portable devices that operate on iOS, Windows, and Android, so it matters not whether you attempt to load it on your iPhone or on a tablet, either way, it will fit your device’s screen just right. Mega Fortune is an entertaining 5-reel slot with a total of 25 adjustable paylines that is courtesy of software leader NetEnt. The game oozes luxury and glamor and incorporates symbols that completely correspond to its overall theme, including jewels, motorboats, limousines, brandy and cigars. Mega Fortune does not lack in terms of extra features, either, since it comes with wilds, scatters and a bonus game that utilizes a wheel with different prizes. Players who succeed in unlocking the bonus game are guaranteed to win one of several cash prizes or in the best case scenario, to walk away with one of the three progressive prizes Mega Fortune has to offer. These include the Rapid, Major and Mega jackpots, the latter being the largest prize. The bonus game starts once you line three or more bonus symbols from left to right on the reels. What further adds to players’ convenience is the fact the games has been adapted for smartphones and tablets, running on all widespread operating systems. 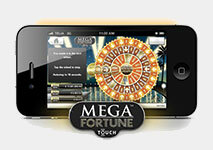 As a matter of fact, Mega Fortune is part of the NetEnt Touch mobile platform which allows for seamless gameplay on touch-sensitive portable devices. Major Millions is another quality slot that bears the brand name of giant Microgaming, one of the oldest software developers in the online gambling industry. The game may not be as visually impressive as some of the titles we have reviewed on this list but with an average jackpot that reaches up to $2 million, it is definitely worth players’ time. The game is a bit more simplified as far as visual presentation is concerned. It features symbols like binoculars, top secret papers, and medals of honor, among other items that fit the slot’s aviation theme. Other than that, the slot has five reels and 15 paylines to offer as well as wilds and scatters. However, there are no free spins and bonus games in Major Millions but its huge winning potential certainly compensates for that. Speaking of winning potential, to trigger the progressive prize, you need to land no less than five wild symbols on payline number 15. Notice that the game incorporates a fixed coin denomination of 0.20 per payline, so there is no way for players to bet less than $3.00 on all 15 paylines per round. Despite being a bit outdated, Major Millions is among the classics on Microgaming’s portfolio which suffices to explain why the gambling software developer has opted for adapting it for mobile devices like smartphones and tablets. Major Millions runs smoothly on devices, based on iOS and Android OS.